Built in the first half of the 13th century by Giacomo Palmieri, a political exile from Pesaro, it was bought by the Venetian Republic in 1381 for the marquess of Ferrara, Nicolò V D’Este. From this it gets its name of “Casa del Duca di Ferrara”. 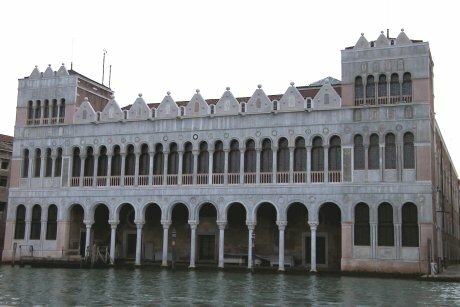 Because of its sumptuousness, the palazzo was used to house princes and sovereigns, such as the Emperor of Constantinople Giovanni Paleologo (1438) and Alfonso D’Este (1562). Over the years, ownership passed from one patrician family to another (Aldobrandini, Priuli, Pesaro) and in 1621 the palazzo again became the property of the Venetian Republic, who conceded it to the Turkish merchants. They kept it as their dwelling and commercial headquarters until 1838. Home of the Correr Civic Museum since 1922, today the building houses the Natural History Museum.